Right now you're probably reading this story on CNNMoney, but someday you could be reading it within Facebook's app. On Wednesday, Facebook started to let a select number of news organizations publish stories directly to the social media site. The nine launch partners, including BuzzFeed, The New York Times and NBC News, keep the advertising revenue. Some of the news outlets are treading lightly, calling it an "experiment" (the word chosen by The Times) and a "test" (The Guardian). But the tests may end up being enormously important. If successful, publishers will have found a new way to make money and distribute content. Failure will make it harder to access the enormous audiences found on social media platforms. In the past, traditional publishers wanted you to visit their sites directly and see the ads they've sold. But this approach is being challenged as people spend more and more time on Facebook and other mobile phone apps. Last year, with this in mind, Facebook reached out to a bunch of publishers and proposed what became Instant Articles. The project has been a badly kept secret ever since. To some, it's an obvious win-win. The news organizations are being allowed to fish where the fish are. There are 1.25 billion of those proverbial fish -- users of Facebook's mobile services -- according to the company. No news publisher can claim to have an audience that big. To many others, however, Facebook is a "frenemy" to the news business, competing for attention and ad dollars. The Times' story about the partnerships on Wednesday referred to industry fear of Facebook's "growing power" and to "concerns that their participation could eventually undermine their own businesses." Indeed, the negotiations between Facebook and some publishers were fraught, and some big names decided not to participate. The ones who did ultimately sign up are The Times (NYT), National Geographic, BuzzFeed, NBC News, The Atlantic, The Guardian, the BBC, Spiegel and Bild. "Fundamentally, this is a tool that enables publishers to provide a better experience for their readers on Facebook," he said. "Instant Articles lets them deliver fast, interactive articles while maintaining control of their content and business models." Fast is a key word: Facebook says there will be no lag time when users click on the stories uploaded by partners like NBC. 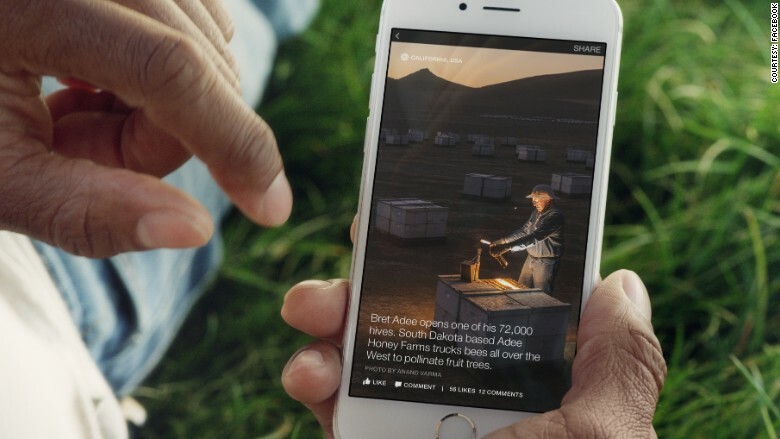 Interactive is another key word: Facebook will make these stories look great on mobile devices, similar to what Snapchat has been doing with another hand-picked group of publishers, including CNN. "Don't forget -- this is a reaction on Facebook's part too... it looked at Snapchat Discover and thought 'uh oh,'" tweeted Emily Bell, director of the Tow Center for Digital Journalism at Columbia Journalism School. The news outlets working with Facebook will keep all of the revenue on ads they sell directly; when the ads are sold by Facebook, revenue will be shared. 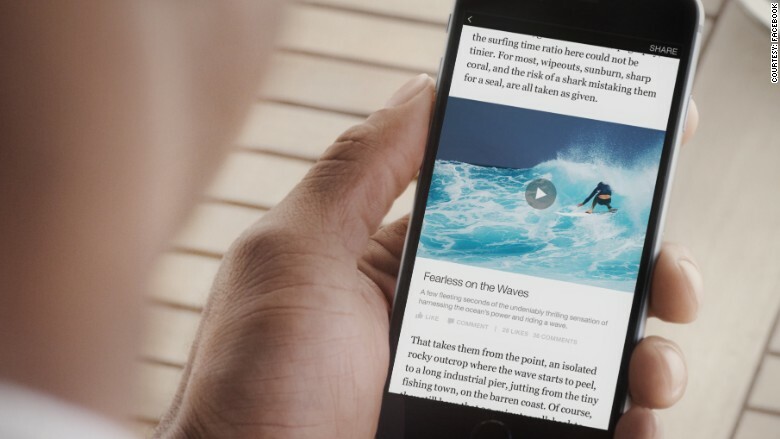 Publishers will also get lots of data about how their stories are faring on Facebook. Perhaps most importantly, news outlets will be able to publish so-called "branded content" directly to Facebook. Also called "native advertising," these posts mimic the look and feel of news stories, but are paid for by sponsors. BuzzFeed will have a "sponsored post" for the new movie "Pitch Perfect 2" "running through our first story," the site said Wednesday, adding that "we are excited for the value this product can bring to our advertisers who get the full benefit of our platform and technology." As the new feature rolls out, users may barely notice it, but the news industry will be paying very close attention. Mathew Ingram, a skeptic who writes about the digital media business for Fortune, tweeted that "the central point to remember is that Facebook controls the terms of this news-publishing deal -- it is holding all of the cards." Joshua Benton, the director of Harvard University's Nieman Journalism Lab, commented that the Facebook partnerships are "probably worth making" for news organizations like The Times and NBC. Still, he wrote, "it's worth noting this moment as an instant (ha) when publishers realized how much power has been pulled out from under them."